2nd Lieutenant, W.J. Grummett, 10th Norfolk Regiment, 1916, shortly after receiving his commission, pose 1, hat on. In the late winter of 1916, as the Eaton Motor Machine Gun Brigade headed for France without him, Will Grummett began Officer’s Training. I wonder if he tried to reverse the whole process? Knowing what he did about the military, I am sure that, while he may have thought about it, he thought better of it, and simply got on with the business of trying to become an officer in the British Army. By February of 1916, officer candidates in the British Army were being assigned to Training Battalions as part of a new program. The duration of the training was four and one half months. Details regarding the curriculum could not be found nor could the exact training location. It would seem Will entered the program as one of the first of the Officer Training Battalion classes just as they began in February of 1916 (The Long, Long Trail: The British Army in the Great War of 1914-1918 website). Upon graduation, four and one half months later, Will was given a probationary commission as a 2nd Lieutenant. This last fact was duly recorded in the London Gazette on July 7, 1916. During this period, from the time his former commander, Captain E.L. Knight annotated his letter providing permission for him to apply for a commission (See Post #3, February) to October of 1916, there is a perplexing gap in Will’s personal records. In subsequent installments of this narrative, I will make reference to training notebooks, order sheets and, of course, the photos to piece the story together. Of his time in training, there is no documentation of any kind. Add to this that the purchase of the camera had not yet taken place and the available information about the military aspects of this period in England becomes quite thin. The only wartime photos are studio portraits Will had taken in his uniform as a newly commissioned 2nd Lieutenant (two poses, one with hat on (see above), one with hat off (see below)) which he must have sent to his parents. 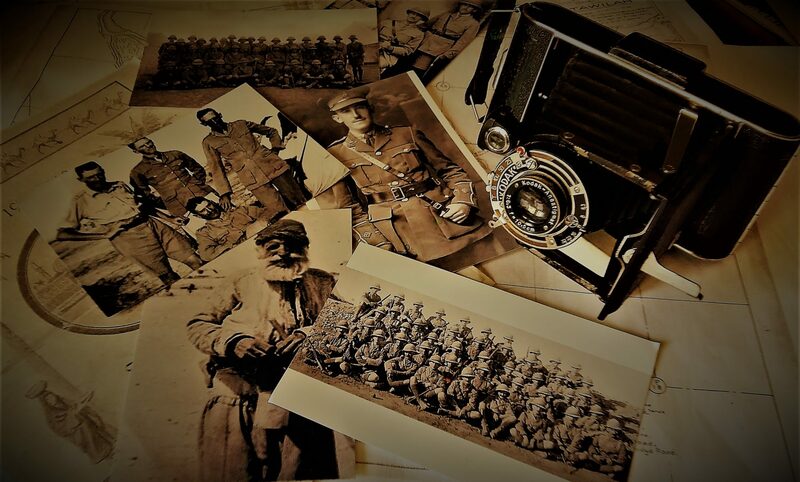 Fortunately, insight into this period comes to us from photos and letters received after the war from a very special family. 2nd Lieutenant, W.J. Grummett, 10th Norfolk Regiment, 1916, shortly after receiving his commission, pose 2, hat off. While he was training, Will formed a friendship with a fellow would be officer named Grantley Le Chavetois. Le Chavetois had been working as a School Master at St. Olaves Grammar School, London, prior to enlisting. He was three years older (born 1888) than Will and probably seemed older since he had his career well underway. Le Chavetois was keenly interested in tales of pioneering and upon finding out that Will was a farmer from Ontario, it is likely that he saw an opportunity for some first hand information. I imagine, that through conversations about Will’s home and life, they got to know one another and became friends. On at least one occasion Will stayed with the Le Chavetois’ in their London home. He met, and spent some time with Grantley’s family, his mother, Mrs. Minnie Le Chavetois, his sister Ida, and a group of close family, friends and relatives. Following their training and probationary commissions, Will was assigned to the 10th division of the Norfolk Regiment and posted to a base at Harwich, Essex, to await deployment. His friend, Le Chavetois, was assigned to the 22nd battalion London Regiment and was posted to active duty in Palestine. Sadly, Le Chavetois was wounded by an enemy sniper’s bullet on November 7 of 1917 and eventually succumbed to the wound, dying in January of 1918. At the time he was wounded, Le Chavetois’ Brigade was pinned down by enemy fire, and he had volunteered to try to get a message through the lines to Battalion command in an effort to prevent remaining units from suffering a similar fate. Le Chavetois had recently been promoted in the field to the rank of Captain: no small achievement in so short a period of time on active service. His body was returned to England and is interred at Camberwell Old Cemetery, London. He is remembered to this day at St. Olaves Grammar School (he was both student and teacher there) through the student community service programme, The Le Chavetois Society. The grave of Captain Grantley Le Chavetois, 22nd London Regiment. Camberwell Old Cemetery, London. The relationship appears to have been founded on a fortnight’s stay at the Le Chavetois home in London, either during or directly following Will and Grantley’s officer training. By this time, Will had been away from home for over a year and entirely in military surroundings. It’s not hard to see why this respite would have meant so much to him. The Le Chavetois family were to a person engaging, intelligent and educated. Mrs. Le Chavetois was a school teacher whose first language was French and both Grantley and Ida had Masters degrees in the Arts. I can imagine Will enjoying the change in conversation and the family atmosphere. During those two weeks, based on Mrs. Le Chavetois familiar treatment of both people and places throughout her letters, the family, with Will very tightly in tow, engaged in a lot of visiting, probably dinner parties and get-togethers, and short trips to friends and relatives in the country. In the letters, Mrs Le Chavetois frequently updates Will – without a thought for preamble or background – on the doings of Grantley’s friends and colleagues from St. Olaves: Mr Kingdom and Mr. Pearse, both fellow teaching masters and Mr. Rushbrooke the Head Master. We are introduced to Mrs. Huxley and Miss Huxley, mother and daughter, both friends of Mrs. Le Chavetois and are updated in the letters at intervals on their health and fortunes. “Mr. Pearse is still at St. Olaves. Very few of the Staff now remain and it is altered since Mr. Rushbrooke’s time..
At times the people and reported events seem to have come straight from the pages of a novel by Trollope or E.M. Forster. This sense is a product of the time, I suppose, but more so of Mrs. Le Chavetois wonderful prose with which she creates these fulsome little vignettes. Rarely are we given much more than a passing reference to any one of the persons mentioned and yet those snippets seem to be enough to give us a complete picture of the people Will met and got to know. Will came to know and to care for Grantley’s sister Ida as well, and with each letter to Mrs. Le Chavetois following the war, he asks how she is coping and what she is up to. Ida appears to have been very close to her brother and his death must have had a profound impact upon her. Certainly, Grantley was deeply grieved by Mrs. Le Chavetois, as the letters testify, with a sense of loss so significant that her view of it seems never to alter from the first letter to the last. “…as time goes on, I miss Grantley more. It doesn’t seem possible that 5 years can have gone since he went. I so long to see him and to hear his voice. From the first to the last letter Mrs. Le Chavetois includes a brief report on Ida’s situation and well-being. I think the choice of the phrase “set her free” sums up Mrs. Le Chavetois perspective on the institution to which her daughter had committed herself. I tried to find out anything I could about Ida (middle name Marie), beyond what the letters relate, but found only a few facts. She received her BA in 1907 and her MA in 1910 from Kings College London. Her thesis, submitted for the MA is entitled, “A Study of Gawayne Douglas’s translation of Virgil’s Aeneid.” To me, these pieces of information suggest a couple of things about her character. First, it is no small accomplishment to get an MA but to get it in the early 1900’s she would have had to have had the brains, the drive and the ability to put up with turn of the century attitudes and the institutional barriers put in the way of women in a largely male dominated world. Ida’s choice of the Aeneid as the focus of her Master’s work may serve to support these speculations. The Aeneid is a Roman epic poem in the manner of the Iliad and the Odyssey, written by Publius Virgilius Maro, or simply, Virgil. In that poem, among other things, are important female characters portrayed as the equals of men, possessing heroic qualities similar to the central hero, Aeneas. Dido, Queen of Carthage, is a strong, intelligent and independent leader of her city. She begins to fall in love with Aeneas but it is a love on equal terms not a submission. And there is, Camilla, a warrior woman, quite similar in character to Perseus or Achilles, who squares off in battle with the Trojans (Aeneas is a Trojan). In the face of Camilla’s armed prowess, the Trojans area at a loss and must make use of subterfuge to finally defeat her. I am guessing that Ida admired these portrayals and they were an important counterpoint to her likely circumstances: an antidote to the prevailing attitude of English society which recognized few rights for women to fashion their own lives and even less should they marry. You don’t willingly spend a year or two with that heady stuff and remain unaffected. When you take all of this into consideration, and with what the letters say about her mother’s character, you can easily imagine Ida as an intelligent, highly independent, and even slightly romantic person. Mrs. Le Chavetois is not forthcoming with reasons for Ida’s decision to take holy vows, but her personal reaction and description of her daughter at the time suggests that Ida’s reasons were not simply because she wanted to “serve God”. I say this because the change was so startling to Mrs. Le Chavetois, so seemingly unlike the daughter she knew. Why then, this radical departure from the lively, intelligent, independent woman who spent years studying an epic romantic poem? I can only surmise that it was a way to try to live with the anguish, and quite possibly the guilt (I imagine Ida as the kind of person who would question why she was still alive when so many had died) at the loss of her brother, and, I am guessing here, many friends and acquaintances in the war. By turning off those things that made her Ida, and focusing much of her being on others, perhaps she found some distance from the things that caused her torment. The casualties of this total war were many and varied. Mrs Le Chavetois died in 1945. Although the letters to Will seem to cease at the end of the 1920’s my guess is that this was because Mrs. Le Chavetois responses were lost or, perhaps, because she was unable to respond. I am willing to bet that she received a note from Will at regular intervals up until the day she died. Ida Le Chavetois died in 1972. She remained a Nun to her death. It i estimated that 25 million people died in the War including both civilians and soldiers. By 1925 most countries that fought had restored their economies to levels of production beyond those achieved pre-war, and the material destruction from the war had been all but cleared away. Battlegrounds were fading away under the work of builders and farmers. The historian, A.J.P. Taylor, has suggested that on the whole the war left no significant, lasting scar, despite the loss of so many. This conclusion is, of course, only possible when one looks at a tragedy from a very great distance.